Brewers 8, Diamondbacks 6 ~ The Bucky Channel - The World of Sports from Wisconsin's Perspective. Brewers get the win today as they beat the Arizona Diamondbacks 8-6. 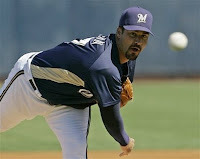 Jeff Suppan looked terrible giving up 6 runs on 7 hits and 3 walks in 3 innings of work. Suppan saw his ERA balloon to a robust 11.25, yikes. Newcomer Chris Narveson continued to pitch well, in 3 scoreless innings of work. It was the hitting today that saved the Brewers. Down 6-3 in the 8th inning, Gabe Kapler hit a 3-run double to tie the game. Then Joe Dillon then added a 2-run home run on the next at bat, to give the Brewers a 8-6 lead. The Brewers are 10-6, and will face the San Diego Padres on FSN Friday night at 9 pm.